The artist has since worked between studios in Los Angeles and the province of KwaZulu-Natal to foster a 25-strong collective of skilled local artisans to focus on the process of bead weaving, which contribute to the new works on show in ‘Solid/Divide’. American artist Liza Lou returns to London since her last solo exhibition in 2012 at White Cube’s former Hoxton headquarters. A series of new works will be presented at the gallery’s Bermondsey outpost in the exhibition ‘Solid/Divide’. Visitors unfamiliar with Lou’s practice will discover on closer inspection that the works are not what they seem at first sight. 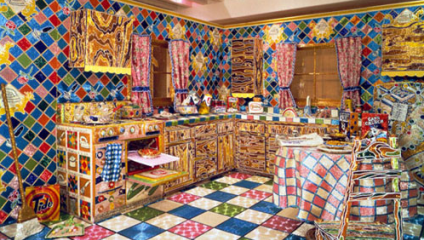 From the time of the artist’s break-through room-size tableau ‘Kitchen’ - installed at the New Museum of Contemporary Art, New York, in 1996 - Lou has earned international recognition for her medium of choice: glass beads. Successive works have continued with the arduous aesthetic of compacted glass beads enveloped over a variety of surfaces and scales to recreate objects in obsessive, three-dimensional detail through seductive and sublime sculptural forms. As well as placing the controversial craft versus contemporary art debate at the forefront of her signature expression, themes around feminism, domesticity, labour and endurance orbit these admirable artworks. In an age of Duchampian demand, where everyday readymades are propelled to contextual significance, admiration for execution is a rarity indeed. As is the impossibility of perfection and the acceptance of the handmade when confronted within a contemporary art environment. No longer committing herself to five years of solitude with glue and tweezers – as was the case to create the multiple items and display installation for ‘Kitchen’ – Lou travelled to Durban, South Africa in 2005 to initiate an art project with Zulu bead-workers. The artist has since worked between studios in Los Angeles and the province of KwaZulu-Natal to foster a 25-strong collective of skilled local artisans to focus on the process of bead weaving, which contribute to the new works on show in ‘Solid/Divide’. Presenting a more distilled and abstract construct, the exhibition will feature monochromatic and duo-coloured canvases wrapped in coloured glass beads. The canvases are stitched in an identical manner and it is through this method of repetitive activity that the imperfect is subsequently exposed. The intimacy between artisan and canvas reveal several impurities across the seemingly colour block surface. The works’ minimalist rendering fights with the nature of the individual beads – each with their own genetic; their variance in colour family; the way the light reflects off their surface – to create both a physical and conceptual tension on viewing. From a distance, the canvas appears to bare streaks, stains or ruptures to its surface. The horizontal balance between the beaded rows and expanse of colour, strongly referencing colour field painting, are disrupted by the nature of the material and the gesture of the hand. These very details continue around the edges of the canvas. Lou’s interest in the idea of object-hood is subtlety communicated by the beaded edges that wrap around all four sides, which further propose a sculptural identity to these canvas-like sculptures or beaded paintings. The works’ success is the symbolism and potential produced by humble materials. Only when manipulated en masse by the human hand, do these tiny, shiny glass beads transform into mesmerising fields of bold order and pure colour worthy of the human eye to witness first-hand. ‘Solid/Divide’ by Liza Lou opens at White Cube Bermondsey on 26th November and runs to 18th January 2015. For more information please click here.